Solitaire veterans, time to prove your possession of talent and fortune in Cruel Solitaire! Your goal in this game is to move all cards by suit from A to K to the foundations. 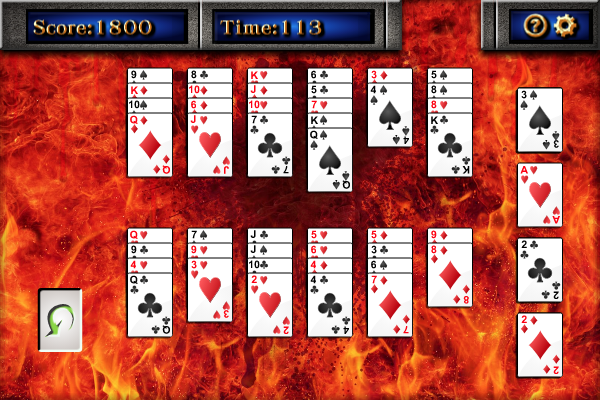 When the game starts, all 4 Aces will be moved to the 4 vertically arranged foundations on the right of the screen. Then each of the 12 tableau piles in the middle will be dealt 4 face-up cards. An empty stock pile is located on the bottom left. The tableau piles are to be built down by suit, and each time only the top card on a tableau pile can be moved. If a tableau pile becomes empty, you cannot place any card on it. If you want to redeal the cards or if you have run out of moves, click the empty stock pile. Then all cards on the tableau piles will be collected starting with the last pile on the lower right to the first pile on the top left. The cards collected will then be dealt to the tableau piles again without shuffle, starting with the first pile on the top left, with each pile being dealt 4 face-up cards until all cards are dealt. The number of redeals is unlimited, but if you cannot make at least one move after a redeal, you lose. If Easy Valentine's Day Sudoku is the sudoku embodiment of summer love than Expert Valentine's Day Sudoku is a long distance, cross continental, 70 year marriage! It is hard work but it is worth it! Poker players have been talking about Titan Poker for quite some time. Our popular online poker room offers fast paced Texas Holdem action, as well as poker tables with card games such as Omaha High, Omaha High Low, 7 Card Stud and 5 Card Stud. Warm your hands with a hot game of Hot Chocolate Mahjong on Winter Mahjong.com! Your mouse will be flying across the mahjong board while you are clicking away at removing those mahjong tiles on one of our favorite layouts of the site. Europa 2 Ways Royal Video Poker Online - download and play. No installation needed. The object of 2 Ways Royal Video Poker is to obtain a five-card poker hand that contains a winning combination (see the paytable on the machine).